A good portion of domestic World Cup Fever was old-fashioned patriotism, but interest in the sport itself has undeniably undergone an uptick. Now, those conservatives who say nobody in America cares about soccer are less interesting than a nil-nil draw at your local pee wee league. People do care. Have you watched a Portland Timbers game? Smoke and banners sway above a bouncing, chanting crowd. 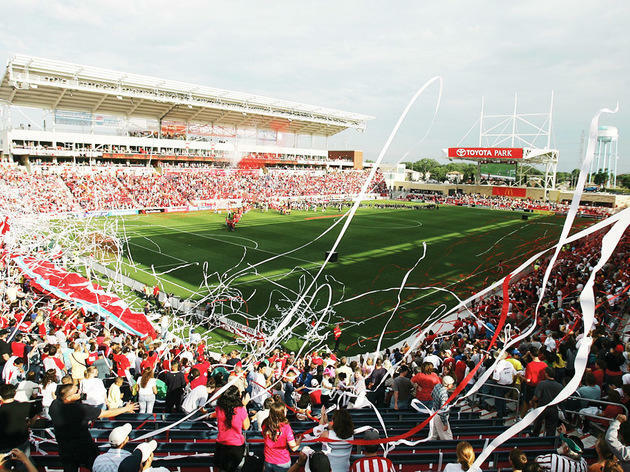 Local interest in the MLS might not be as strong as in the Pacific Northwest or, say, Kansas City, but a Chicago Fire game is a blast. It's a haul to get out there, which means the organization goes out of its way to please. The rowdy spectators behind the north goal will give you a taste of overseas fandom. Though it's becoming increasingly quaint to refer to rabid soccer enthusiasm as a foreign concept. Now that you perhaps care, here is a quick guide to help you jump into the Fire. Speaking of which, the team really should use that Harry Nilsson song. Unless you care about jam bands or futbol, odds are you have not made it down to Toyota Park. Unfortunately, the distance to the Bridgeview (that's a Southwest Suburb) stadium is probably holding the Fire back from developing a Timbers-like following. If the team played downtown or in Wrigleyville, the place would be packed. The frustrating thing is that public transportation cannot take you to the field. It sits in a dead zone between the BNSF and SWS Metra lines, beyond the reach of the Orange Line's Midway terminus. The good news: party buses. The team's Pub to Pitch service runs shuttles from six soccer-friendly Chicago bars, like the Globe and Galway Arms. Yes. Absolutely, yes. Clark is awful. Sparky can hang with Benny and Tommy. Sorry, no. Of the 19 teams in MLS, the Fire has the fewest wins so far this season: just two. They've played 16. But that's okay. You probably care about the Cubs. That being said, we're about halfway through the season, with 18 games remaining, and the Fire needs just a couple wins to get back in the playoff hunt. Ten of the Fire's game have been draws, so they're able. The Fire won the MLS cup once, in 1998. Harry Shipp is your man. The Lake Forest native is the frontrunner for MLS rookie of the year, with five goals in 13 appearances. The former Notre Dame star even looks a bit like Patrick Kane. Shipp scored a hat trick against New York in May. Keep an eye on him as the US Team builds toward a 2018 World Cup run. He's also worth following for his candor on Twitter at, what else, @championShipp11. About half of the USMNT players from the World Cup earn their money in the MLS. The Seattle Sounders and Sporting KC have the big names you likely remember—Clint Dempsey, Graham Zusi, Yedlin, Besler. 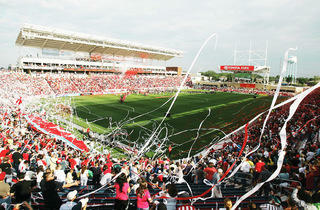 Sadly, those two teams will not be hitting Toyota Park again in 2014. That being said, you can see Michael Bradley's Toronto FC (Sept 13) and Australia's wonderful Tim Cahill, who scored one of the top goals of the World Cup against Holland, with the New York Red Bulls (Aug 10). On July 26, the Fire will host a friendly with the Tottenham Hotspurs of the English Premier League.